David Lilly aims to provide you with a stunning, artistically beautiful addition to your home, or to give back to you the beauty that was diminishing over time, of an existing piece of stained glass. At Sussex Leaded Lights we have a professional team of craftsmen with over 50 years experience. We produce and install traditional leaded lights in listed buildings and domestic properties throughout Southern England, and further afield. Innovative "one-offs" are normal everyday practice. Your one-stop "glass-art" specialists, with a touch of wood if required! Offering a worldwide service. English & Spanish spoken. I own 2 kilns and specialise in fused glass wall art. I have developed techniques which allow me to create large scale art panels. The largest piece I have made so far is 3.6 mtrs from top to bottom and is made of 7 interlocking panels. I work to commission, and have recently begun creating pieces for sale. 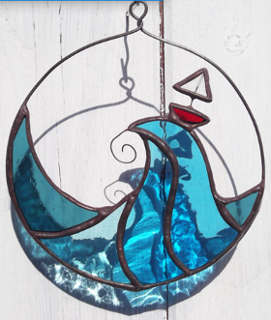 Jose Heasman is a Sussex-based artist working in stained glass. Using the copperfoil technique, she produces handcrafted, original designs in lamps, screens, panels, light-catchers, mirrors and candleholders. Her work is available for sale and to commission. She exhibits throughout Sussex, in Somerset, and at Hampstead Craft Fair in London. Every May her stained glass work is on show during the Brighton Festival. 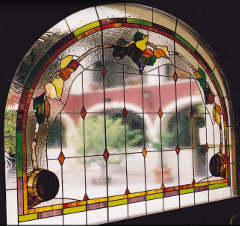 Traditional stained glass and lead light panels are made to order. Panels are made in the traditional way, using lead came, although they can be incorporated into double-glazed units if required. Details such as lettering can be painted on, using glass enamels, which are then fired in the kiln. I make artistic glass items using the copper foil stained glass technique developed originally by Louis Comfort Tiffany in the 19th century. This gives me a flexibility with the forms my work takes and allows me to take liberties with the objects I include. 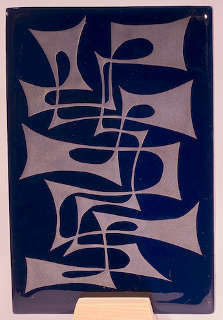 Contemporary architectural stained glass and glass art, AMGP, master glass painter. Public Stained Glass includes Heraldic Panel (Richard III), All Saints, York Minster and the Millennium Window, Church of St John the Baptist, Westfield, Sussex. 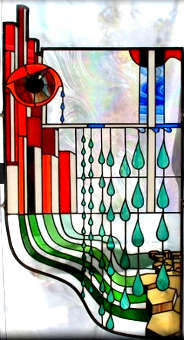 Labyrinth Stained Glass produce bespoke work in traditional contemporary stained glass and leaded panels. Today our small studio not only produces beautiful new works in Art glass but also works in Acid Etched, Brilliant Cutting, Sandblast Etched, Enamelled, hand engraved and Traditional Leaded Lights from traditional Sheet glass. Designing and making coloured glass windows, screens, and lights as well as lamps and other small stained glass items. We have a wealth of expertise in all aspects of stained glass, leaded lights and historic glass. At Diomo Glass, bespoke leaded lights are designed and built using traditional leading up techniques. 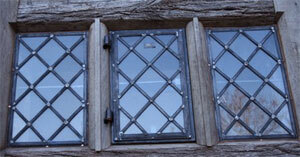 I also restore leaded lights and carry out on-site repairs. I am a glass artist working on both large and small scale. I work on a variety of levels, with bold images for impact yet containing small intricate details to be seen close up. 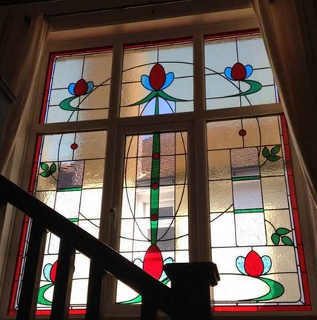 Specialising in the construction and repair of stained glass and leaded light windows.